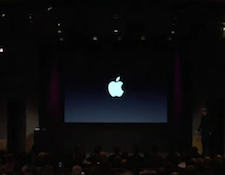 Apple unveiled the iPhone 4S yesterday, showing off new hardware and updated features. While the lack of an iPhone 5 might have disappointed some Apple fans, the iPhone 4S along with iOS 5 is sure to benefit the professional crowd. The iPhone 4S will be released on October 14th on AT&T, Verizon, and Sprint at a price point of $199 with a 2-year contract. The slower iPhone 4 will still be available, but it will sell for a lower price of $99. Although the design remains the same as its predecessor’s, the iPhone 4S is much faster, packs a more powerful camera, and even understands human speech. For the first time since its release the iPhone is now available on Sprint, which will become the third carrier to offer the iPhone. There has been plenty of demand for the phone, but contract cancellation fees and switching to a new carrier have deterred many from purchasing it. With iOS 5, you no longer need a computer to own an iPhone, iPad, or iPod touch. You can activate and set up your device wirelessly and download free software updates directly onto your device. You can also backup your phone using iCloud, which allows you to seamlessly integrate your apps so you can access your content – including documents, contacts, calendars, and more – on all of your iOS devices. 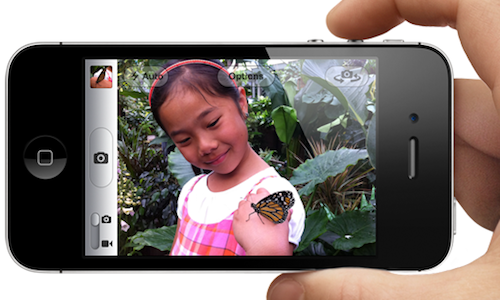 The iPhone 4S boasts an 8-megapixel camera – which is 60% more pixels than the 5-megapixels used in the iPhone 4. With a faster shutter speed and better quality in low-light conditions, your iPhone’s camera could potentially become your only camera. With the updated iOS 5 camera app, you now also have the ability to edit, crop, and rotate photos right from your phone. To make things easier photos can be taken by double-tapping the Home button or by pressing the volume buttons. For the first time ever it will feature 1080p video, which makes it especially handy for capturing demo videos, vlogs for YouTube, or even conference keynotes. 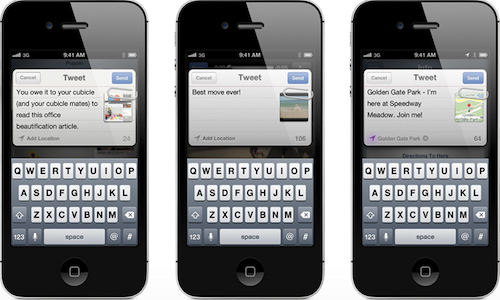 By integrating with Twitter, iOS 5 has made it even easier to tweet from your device – including iPhone, iPod, and iPad. You only have to sign in once in Settings and from there you’ll be able to tweet directly from Safari, Photos, Camera, YouTube, or Maps. You’re also able to add a location to any tweet no matter which app you’re tweeting from. Additionally Contacts applies your friends’ Twitter usernames and profile pictures so you can start typing a name and iOS 5 will make the connection. This creates a much more fluid social experience, which will be beneficial to community or social media managers, or anyone who likes to stay connected to Twitter. It’s still unclear if we can expect to see integration with other social networks, such as Facebook. You receive all kinds of alerts and notifications on your iOS device: email, text, friend requests, tweets, comments, and so on. iOS 5 offers you a better way to keep track of all alerts in one location with Notification Center. You can choose which notifications you’d like to see and they will appear briefly at the top of your screen. The Lock screen will also display notifications and you can swipe any one to act on it. One of the best ways to stay organized is to create a to-do list. 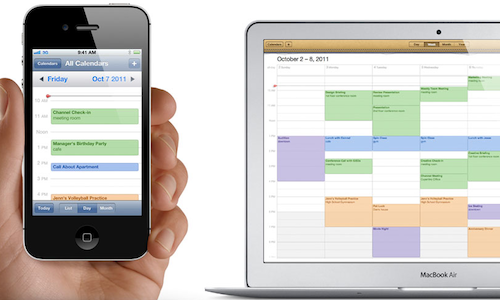 iOS 5 takes it one step further with Reminders and lets you base your tasks on your location. For example, if you’re the first one in the office, but never remember to start the coffee, you can set a reminder and you’ll receive an alert the minute you pull into your office’s parking lot. 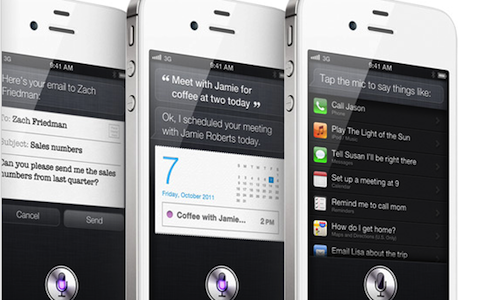 The voice-recognition and virtual assistant service Siri can do things like set alarms, schedule appointments, and dictate messages, as well as search the web to find restaurants, directions, or answers to questions. This feature is especially handy while you’re on the go and hands-free. It will be impossible to determine just how beneficial the iPhone 4S will be in your day-to-day life until its release on October 14th. However, we feel pretty optimistic that iOS 5 – available on October 12th – will have a positive impact on your professional life. The focus seems to be on accessibility and organization, which can help you maintain an efficient and productive work/life balance.